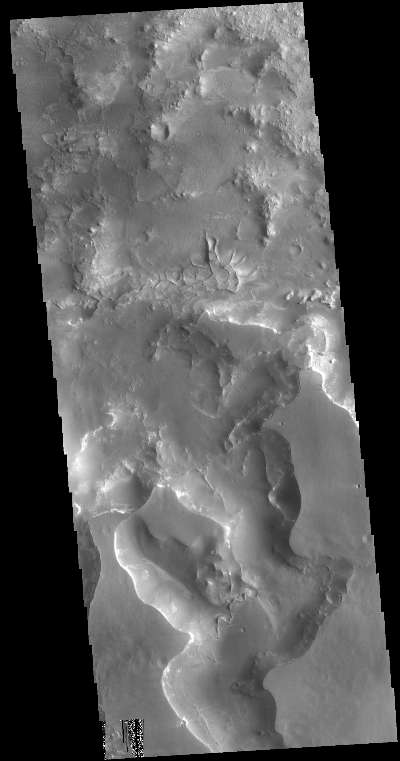 This VIS image is located on the margin of the Nili Fossae region and Isidis Planitia. At the bottom of the image a channel feature is visible, the branch on the right appears to empty into the surface at the top of the image. The branch to the left does not reach the top of the image, so it is likely flowing from the upper left into the bottom channel. The 90 degree bends of this large channel feature indicated that tectonic forces are affecting the features formed in this region. This is further supported by the series of very small orthogonal ridges just north of the center of the image. These small ridges probably were formed in a multi part process. First tectonic activity created fractures in a preexisting rock, then a new material filled the fractures, finally erosion of the host rock occurred, removing the original materials and leaving just the fracture fill. Both the large and small scale features in this region point to a long period of tectonic activity in this region.